A healthy take on the patty melt. Preheat grill and panini press to medium heat. Form turkey sausage into 5 burgers. Place burgers on grill and cook for 3 minutes, rotate 90 degrees to form grill marks and cook for 3 minutes. Flip burgers and repeat, cook until internal temperature is 165°. Remove burgers and place on a platter lightly tented with foil. In a large sauté pan, heat olive oil over medium heat. Sauté onion until caramelized, about 8 minutes. Add red pepper and cook until softened, about 8 minutes. Top 5 slices of bread evenly with hummus. Top each with onion and pepper, 1 slice of cheese, burger patty, 1 slice of cheese, and second piece of bread. 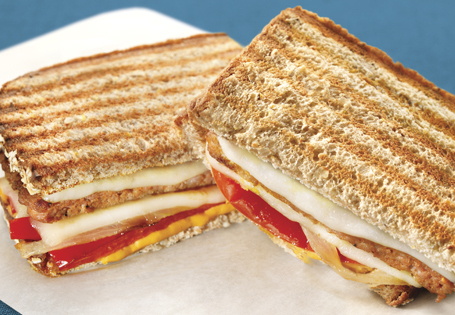 Place 2 sandwiches in panini press, cook until bread is crispy and cheese is melted, approximately 5 minutes. Repeat with remaining sandwiches. Cut sandwiches in half.